Candid, fearless and provocative - the author of American Psycho on who he is and what he thinks is wrong with the world today. Bret Easton Ellis is most famous for his era-defining novel American Psycho and its terrifying anti-hero, Patrick Bateman. With that book, and many times since, Ellis proved himself to be one of the world's most fearless and clear-sighted observers of society - the glittering surface and the darkness beneath. In White, his first work of non-fiction, Ellis offers a wide-ranging exploration of what the hell is going on right now. He tells personal stories from his own life. He writes with razor-sharp precision about the music, movies, books and TV he loves and hates. He examines the ways our culture, politics and relationships have changed over the last four decades. He talks about social media, Hollywood celebrities and Donald Trump. Ellis considers conflicting positions without flinching and adheres to no status quo. His forthright views are powered by a fervent belief in artistic freedom and freedom of speech. Candid, funny, entertaining and blisteringly honest, he offers opinions that are impossible to ignore and certain to provoke. What he values above all is the truth. `The culture at large seemed to encourage discourse,' he writes, `but what it really wanted to do was shut down the individual.' 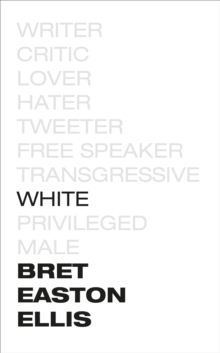 Bret Easton Ellis will not be shut down.